This cityscape in Italy captivated 16th century Renaissance masters like Leonardo da Vinci - and continues to do the same to 21st century travelers. 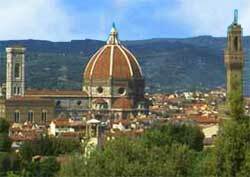 The massive yet refined 15th century Gothic cathedral dome (center of photo) is Florence's skyline icon. The Duomo dominates the Florentine cityscape. It was designed by Fillipo Brunelleschi and intensely admired over a century later by Michelangelo. The 14th century shop-lined covered Ponte Vecchio (not in photo) is another famous cityscape-defining structure. By far the best perspective view of Florence is from across the Arno River at the hillside Piazzale Michelangelo lookout.